Guernsey cattle were developed on the Island of Guernsey which is one of the Channel Islands off the coast of France. The breed was developed about 1,000 years ago by monks who moved to the island and brought with them the best bloodlines of French cattle, Normandy Brindles, also known as Alderneys and the Froment du Leon breed from Brittany. Guernsey cattle also inhabit the Islands of Alderney, Herm and Sark. In 1819 a law was passed on the islands prohibiting the importation of live cattle to the islands for any purpose. The breed has constantly been improved and maintained pure since that time. The first Guernseys arrived in Canada unintentionally. Guernseys were being taken by ship to New England states, when rough seas forced a landing in Nova Scotia. The residents were so impressed by the cattle that asked the Federal Minister of Agriculture to import some of these easy tempered, golden cattle. In1878, Sir John Abbott, who later became Prime Minister of Canada in 1891, made the official importation of Guernseys to Canada. The breed became very popular in the Maritimes and eventually several herds traveled overland to British Columbia. Guernseys are generally a beautiful golden fawn colour with white markings although variations from a brownish red and white to a very light fawn and white are common. They are a medium size dairy cow with most mature cows weighing 550 kgs to 700 kgs. Guernseys are known for their quiet temperament, calving ease, early maturity, and efficiency in converting forage to milk solids. The breed is adaptable to extreme climate conditions as well as various housing systems. 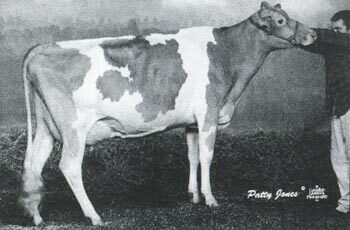 Guernsey milk is characteristically high in milk solids and has a distinctive golden colour, resulting from its unusually high content of Beta Carotene.